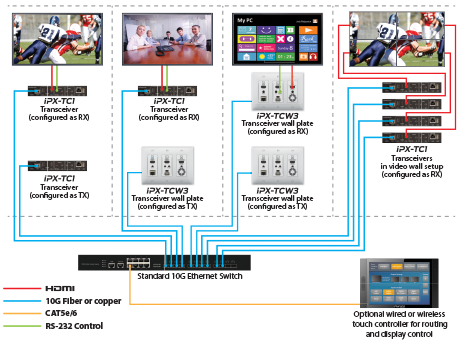 IPBaseT introduced at InfoComm - Booth 3059 - Aurora Multimedia Corp.
Aurora’s IPBaseT™ technology combines 4K uncompressed video with zero-latency seamless switching, video wall and multiviewer modes, digital audio, USB 2.0, Ethernet, and control. Utilizing the bandwidth of a standard 10G copper or fiber network, IPBaseT supports a large, seamless UHD video and audio matrix, and it does so while replacing multiple technologies and products with a single-box distributed platform. The days of needing a separate AV switcher, control system, video-wall processor, audio/DSP converter, and more are a thing of the past! With the IPX series transceivers, audio, video, data, and control can be sent securely to one or many units using off-the-shelf 10G Ethernet switches. When the IPX-TC1 is set up to be a transmitter, the 2 HDMI inputs become a source switch and the HDMI output becomes a potential loop out. When set up as a receiver, a user can select the local HDMI inputs or an IP source. Seamless switching of the sources further enhances the presentation. Regardless of how the IPX-TC1 is set up, the audio can be de-embedded at any location. To keep the system friendly, a customizable OSD and web server are available to be programmed as required. For RJ-45 LAN devices, the 1G Ethernet port allows full bandwidth end-to-end over the IPX-TC1 10G connection. Choice is important. That’s why the IPX-TC1 has an SFP+ port that can use single or multi-mode fiber – making the IPX-TC1 the ultimate AV IP product on the market today.